Planning a residential move can be stressful, hiring the wrong moving company a nightmare. With UniRelo Moving, you can rest assured that you are hiring the Universal leaders in moving & storage, and expect a stress free, moving experience. UniRelo Moving is built on the principles of honest dealings with our customers, no surprise costs, and with personal attention from quote until delivery. We are always looking for ways to create value for money for our customers and to consistently providing the highest quality services. Our sales team is equipped with the latest software and technologies to accurately size your move and our operations field staff have the training and tools needed to execute your move flawlessly. Our emphasis is on providing local service with global excellence. We service all bay area cities including Alameda, Antioch, Berkeley, Brentwood, Concord, Cupertino, Danville, Dublin, El Sobrante, Fremont, Foster City, Gilroy, Hayward, Livermore, Milpitas, Mountain View, Novato, Newark, Oakland, Palo Alto, Pittsburg, Pleasanton, Pleasant Hill, Richmond, San Francisco, San Jose, San Ramon, Santa Clara, Saratoga, Sunnyvale, Tracy, Union City and Walnut Creek. Professional, trained and uniformed movers. We use only our own, permanent UniRelo staff that is committed to exceeding your expectations and completing your move professionally and efficiently for you. Fully licensed, insured and bonded service within the state of California. Reasonably priced moving boxes and packing supplies. Clean trucks fully equipped with all the necessary moving pads and equipment. Respectful of rules within housing communities. Member of the Better Business Bureau. We have maintained an A+ rating with the BBB for five consecutive years. Over the last 15 years that we have been in business, we have earned a sterling reputation in the market for customer focus, customer service and reliability. 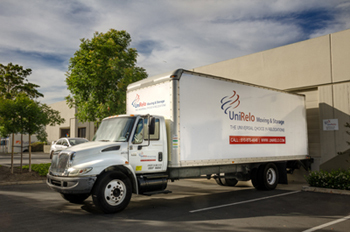 While some local movers try to reel you in with a low estimate and later tack on additional charges, UniRelo Moving offers FREE, No-Obligation, Guaranteed estimates on local moves.